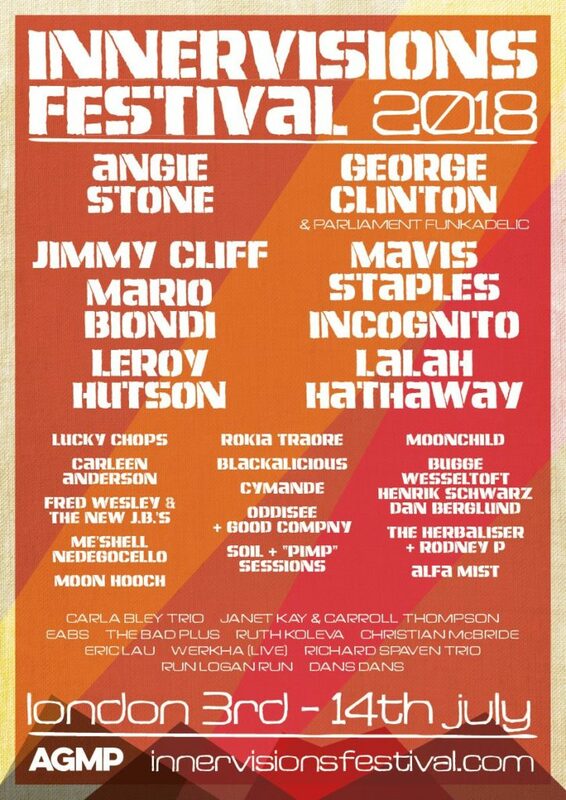 JIMMY CLIFF, ANGIE STONE, LEROY HUTSON, MAVIS STAPLES, LALAH HATHAWAY, INCOGNITO, BLACKALICIOUS & MANY MORE! Innervisions is a brand new festival of Soul, Jazz, Blues, Funk, Reggae, Hip Hop, Latin and World music featuring some of the finest global performers in their field. The festival will be held in some of London’s premier arts and music venues for 12 hot Summer nights from Tuesday 3rd through to Saturday 14th July 2018. Destined to be a regular event on the festival calendar by one of the UK’s top specialist promoters, Innervisions is the perfect reason to leave your tent in the loft and stay in the city! Kicking off on 3rd July with Lalah Hathaway at London’s KOKO, artists performing at the festival include: George Clinton & Parliament Funkadelic/ Jimmy Cliff/ Incognito/ Angie Stone/ Leroy Hutson/ Mavis Staples/ Blackalicious/ Fred Wesley & The New JB’s/ Cymande/ Carleen Anderson/ Rokia Traore/ Dayme Arocena/ Mario Biondi & Ruth Koleva/ Moonchild/ Driza Bone Soul Family/ The Herbaliser/ Rodney P/ Soil & Pimp Sessions/ Carla Bley Trio feat Steve Swallow & Andy Sheppard/ Daisy Hicks/ Christian McBride New Jawn featuring Marcus Strickland & Josh Evans / Janet Kay & Carroll Thompson/ Bugge Wesseltoft, Henrik Schwarz, Dan Berglund/ The Bad Plus / Run Logan Run/ Me’shell Ndegeocello/ Oddisee & Good Compny + EABS/ Alfa Mist/ Eric Lau/ Hypnotic Brass Ensemble/ Lucky Chops/ Moon Hooch/ Rebel Kleff and many more still to be announced!